Founded in 1993, Thompson Appalachian Hardwoods has grown from a small green sawmill to a full-service forest products company, offering top-quality, kiln dried Appalachian hardwoods. From humble beginnings as small band mill, the family-owned and operated company has grown to a fully-optimized sawmill, dry kilns, concentration yard, planer mill and comprehensive timber procurement program. For more than 20 years, we have built our reputation on customer service and quality. Our success is the result of our commitment to maintain the philosophies on which Thompson Appalachian Hardwoods was founded – faith and hard work. 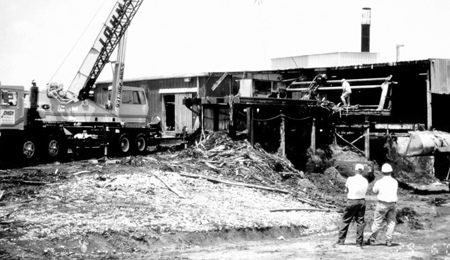 In April 1993, Nordeck and Mary Claire Thompson purchased a small band sawmill in Huntland, Tennessee that had been out of service for more 10 years. The process of re-tooling began immediately, and the mill was operational by June. In order to expand production and increase yield, the company updated the mill by installing numerous machinery centers, notably, a thin-kerf gang saw and a seven-foot double-cut band saw. Thompson Appalachian Hardwoods began kiln drying lumber in two newly-installed dehumidification dry kilns. During that time it added a de-stick line, trim saw system, precision chipper and additional warehousing. Thompson Appalachian Hardwoods began its first lumber export program. Thompson Appalachian Hardwoods opened a sales office in Norris, Tennessee. Thompson Appalachian Hardwoods continued to upgrade the manufacturing plant to maximize production, adding a ring de-barker with metal detector and upgraded scanning and optimization systems. Thompson Appalachian Hardwoods purchased a concentration yard facility with 550,000 board feet of dry kiln capacity and a planer mill. Thompson Appalachian Hardwoods relocated the corporate headquarters to its new dry kiln and concentration yard facility in Huntland, Tennessee. We continue to increase production capacity and provide value to our customers. In 2013, we installed a thin-kerf horizontal resaw system, extended the destick processing line and a post kiln drying double-end trimming system. In addition, we invested in dry kiln efficiency and expanded warehouse capacity allowing the company to continue providing the highest-quality Appalachian Hardwoods to our customer.